Panel Guard models do not require wiring so installation is quick and easy and the energy use reduction advantages of using a thermostat are maintained. 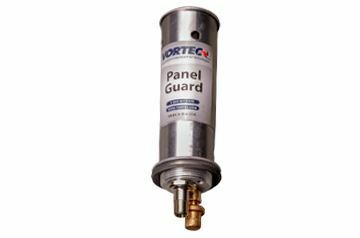 Panel Guard Enclosure Coolers enhance the benefits of Vortex coolers for enclosure cooling by adding a mechanical thermostat for optimum temperature control without the need for wiring. Standard Vortex Coolers utilize an electrical thermostat with a solenoid, so installation must include running wiring from the cabinet to the Cooler. Panel Guard models do not require wiring so installation is quick and easy and the energy use reduction advantages of using a thermostat are maintained. Panel Guard Enclosure Coolers are available in 3 different cooling capacities and are rated for NEMA 4 enclosures. All of Vortec’s Enclosure Coolers keep Electrical and Electronic Enclosures cool, clean and protected and are a low cost alternative to expensive, high maintenance air conditioners; and avoid contamination with dirty, humid air caused by fans.